← A pest. For a pest. Back in 2013, about a week before the summer solstice, a fellow Tripleshotter came up with an idea so ridiculous, it was certain to become a Tripleshot tradition. As the finishing point of our weekday rides, the Beacon Hill Park loop is well known to every Tripleshotter (as are the Park’s resident peacocks, who have a habit of congregating on Circle Drive precisely where and exactly when we’re in the midst our all-out sprint finish). Circle Drive is almost exactly one mile around, so our summer solstice century calls for exactly 100 laps*. For our winter solstice ride – a metric century (100 kilometres) – we circle the Park 62 times. Idiotic, yes – but that doesn’t stop dozens of us from getting up at 3:30 a.m. and joining the ride, which gets underway between 4 and 4:30. En route to this year’s TSSSSC (Tripleshot Silly Summer Solstice Century), I doodled a caption for the morning’s activity. The second image is a close-up of my ride around and around and around Circle Drive. * For the record: I completed only 81 laps of Circle Drive. I tallied the balance of my 100 miles (and then some) while doodling my message on the way to Beacon Hill Park – around 36 km (22 miles) of bike-writing. This entry was posted in Uncategorized and tagged Beacon Hill Park, bicycle, bicycling, bike-writing, century ride, creativity, cycling, garmin, gps, strava, summer solstice, victoria bc. Bookmark the permalink. great job! Isn’t there a ‘famous’ artist who does this as well? or is that you ! 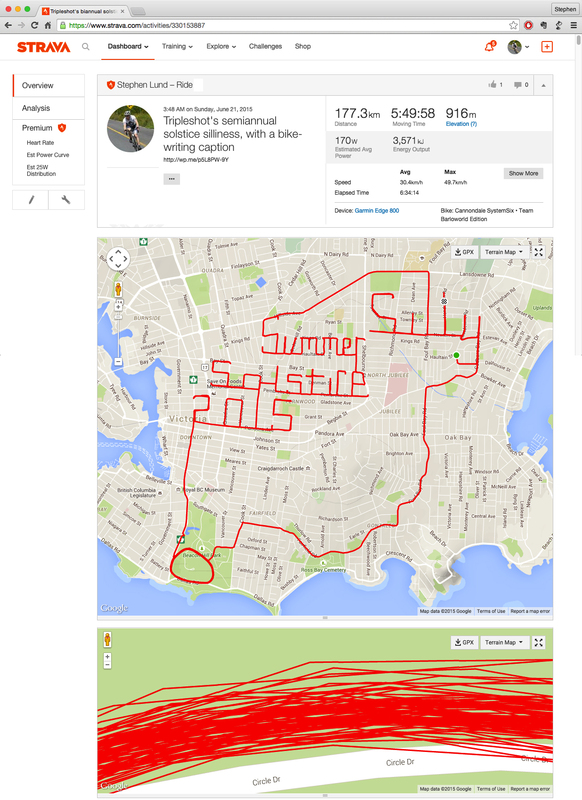 I’m not sure I can lay claim to “famous artist” but yes – Strava art is kinda my thing. I started Strava-doodling in January, and most of what I’ve done – nearly 50 GPS doodles now – is here on my blog. Thanks for the reblog!